There is a UI prototype now for testing, this is a call for people to start that. If you want to test you can find Gutenberg here. You can test in any way you want. You can test yourself and also test others. You can take images, audio or video. If you do create a video don’t forget to pull out those bugs, action points and do a summary. Cutting smaller videos out is also really useful. (on first look) Can you explain in words what each section does? Can you write a paragraph of text? How does it feel? What are your thoughts? Can you add an image? How does it feel? What are your thoughts? If you find a bug please report it in this repo. You can also leave results from your user testing either as a comment here, or you can link to a blog post. As specific things need testing, further posts like this can be made. Thanks to @folletto and @joen for helping with this post. Edit: as mentioned by @grappleulrich, this is very much in the early stages as a prototype. If you find an issue though please report it on the repo and also focus on how the flows work at this point. How much of the prototype should be working? The text alignment buttons and adding a new element did not work for me. When I enlarged the image, I expected the enlarge icon to inverse so that I could click on it again so that it would return the image to a smaller size. A good point @grapplerulrich, this is currently a prototype where the flow would be good to be focused on. As it develops and is worked on, we can drill down a little more. This said, if you find an issue, totally report it in the repo. I agree. I too expected the reverse to happen when going from a full width image back to whatever state it had before clicking the full width image. This can also mean when in full width mode that the arrows points inward. So one can click the same icon again for the image to go inward. I really am impressed with the initial flow! Good and smooth. Sharp icons. A really strong beginning prototype. I like the easy, visual inline editing and clean UI. That said, I had a few moments of disconnect. I admit some of these might simply be from the fact that the prototype isn’t 100% functional. “title” is an H (heading), but tagged as an H2 when I inspect the page source. What if I want an H1 or H3 etc? The up/down arrows for ordering blocks are nice, but might make more sense if replaced with drag and drop vertical ordering. I may want to move blocks more than one space up or down. The topmost block has an up ordering arrow and the bottom on has a downward ordering arrow. These should be grayed out as they are not true options. When a block is selected, clicking the “glyph” (H, paragraph symbol) does nothing. I wish it allowed me to change the type of block, like changing a paragraph to a blockquote, for example. When images are aligned right, the content block “below” it shows up next to it, with each overlapping the other. Adding new item menu: initially it confused me to see paragraphs and lists as separate items. I think of a list as a content element within a paragraph. Adding new item menu: Again, having only one “H” option, if that is the final treatment, is limiting. Is that what the arrows are for? I never realized that. 🙂 I did find that I could move the the image block around with drag and drop, however! It is confusing to then not be able to move the text blocks around the same way though. I think drag and drop is difficult if you have to scroll while dragging. I like the arrows to reorder content, one tiny details I’d like to see is the mouse cursor to move with the block so it will be easier to move blocks more than one space up or down. I pretty much agree with all your points. I don’t think you have to replace the up/down arrows with drag and drop I think there is room for both. Perhaps holding down the left mouse button would activate a mode that would allow you to drag the content block. Can’t align text or edit in anyway. I guess it’s not a bug but the prototype is not full working. The paragraph works fine and you can move it up and down easily. You can’t create anything else so that’s it. I really like this UI. May I ask what browser/OS version you used for testing? I like the overall cleanness provided by contextual toolbars. I find annoying that styling toolbar covers paragraph alignment toolbar. It is especially evident when you have a paragraph with just a few words. All the other tools are not working. Not sure where the styling toolbar should be when adding styles to text within a paragraph of a text block. But currently it will cover up the text of the previous line, when selecting styles on the current line. 1- I found that buttons/actions that didn’t do anything shouldn’t be highlighted. Example: if i moved the image inside a paragraph, the arrows would be still clickable and change to darker color. Another example: next to each block there’s an icon that represents it. Hovering it, it changes color and the mouse cursor changes to “pointer”. 2- buttons for the current state shouldn’t be highlighted. Example: When in a paragraph aligned to the left, hovering the “align left” button changes cursor. Good work tho, looking forward to more functionality. Great first prototype. The component-based workflow is the right way forward! I’d love to see something done for touch devices. They are the most common way to browse (and likely edit) content, but become a second-class citizen with the lack of hover effects. I don’t have the answer but something should be done to improve usability on touch devices. @joen can answer there more, but I think I’m right in saying that whatever end editor happens it will work elegantly on mobile. Cannot see options to move selected blocks (they appear to be off-left). If you tap on the heading then tap on the + menu (bottom left), a disorienting screen re-jigger happens. Cannot create a new paragraph or add an image (options in the (+) menu were unresponsive. Testing note: I tried out a new screen recording app called Rec. to record the video. I’m liking it so far! ⭐️ ❤️ for reporting those @designsimply! On Safari/Mac not much actually works. I can edit existing sections, but I cannot add new ones. I can’t change alignments. I can’t apply text styling. Oh and I can move sections up and down. Isn’t it the case that in Safari these days, not much works, full stop? I use it all the time, and it’s much snappier these days 😉 Seriously though, most everything works fine. I also am currently using Safari as my main browser (I’m weird and rotate..). I am not getting the same issues, which makes me think something was updated in repo – so yay. Or alternatively there’s something else we need to dig deeper on. It’s a good reminder to ensure we cover all major browsers in what we 🚢 . Is there any intent for the editor to allow you to do anything beyond adding text and images using the theme’s default styling? E.g add additional padding or margin to a P tag, change colour of the font or background, split a content block into two columns? I’m not necessarily talking full page builder but it would be nice have some additional features. add additional padding or margin to a P tag, change colour of the font or background, split a content block into two columns? I’m not necessarily talking full page builder but it would be nice have some additional features. I totally agree about the columns. Nothing fancy is needed here, perhaps just an option to split the paragraph block in 2 columns. Padding and margin stretches it too much I’m afraid. I would love to have this built in, but not all users know what padding and margin is, my wife doesn’t. Perhaps we could just include some margin options, and perhaps even use more familiar terminology, like “spacing” or something that will help the user understand that the setting affects the space / distance with the neighbouring blocks. Even a page builder like Divi has built in margin and gutter controls. I think end users would appreciate something similar in the new editor. I think the answer to that is yes. There have been some great discussion in the #core-editor channel about how far things go and what a content block is/should be. At this point, it makes sense to focus on parity – getting the new editor like old. But if anything can be a content block, then columns open up. Tonight we looked at this other prototype at the Lehigh Valley WordPress Meetup, but we have overlapping notes to the Gutenberg prototype. We had thirteen people in attendance ranging in skill sets from intermediate to advanced. We projected the prototype so everyone could see it and ask questions and ask for specific changes to be made. We immediately discussed how this is much more friendly for any user. Seeing the styling of the website on your edits would make it easier for novice users to understand what their edits are doing. “Novices like the front end feel right off the bat” was one comment in particular that we agreed upon. We seemed to share frustrating conversations with clients about convincing them the dashboard edits will look right on the page templates. This is a real WYSIWYG editor. This interface also gets us closer to Squarespace editing, which was thought to be more friendly than the currently disconnected dashboard interface. Plugins like Beaver Builder help, but feel too overwhelming and carry too many options. These prototypes benefit from being simple, no matter your skillset. Issues surrounded the UI elements next to the content. The up and down arrows everyone thought would change the heading type (H1, H2, H3, etc. ), or allow a change to Paragraph or Blockquote. The “H” and paragraph markers next to the content are thought to be “too HTML” while the rest of the Editor is more like Google Docs or Microsoft Word. 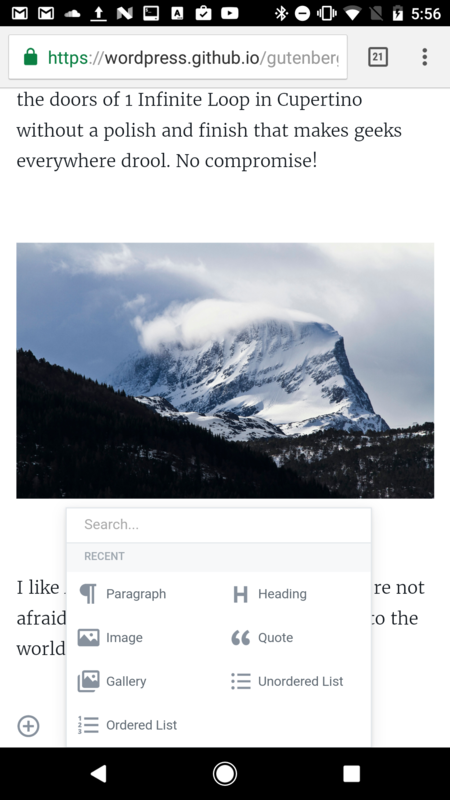 Some wanted to keep these heading, paragraph, and media controls while others thought it should be similar to TinyMCE’s document editing interface. We discussed user roles and how it would be helpful for more advanced “HTML users” to see these heading and paragraph indicators while Authors and Contributors may not see them. The arrows to move the section blocks seemed ok, but some wanted the sections to be drag-and-drop. We all agreed this is a great direction for the Editor. Its strength is its simplicity. One of our participants used to work at Acquia and warned against making things too complicated. He was very stoked on this prototype. Additionally, we developed more refined focuses for the onboarding trac ticket I’ve got going with how the Editor can help get new users creating content quickly. I will post those notes on the trac ticket. @gabelloyd, so awesome! Thanks for doing that testing and please extend that to your meet up group. In the future, it would be amazing if you could also look into videos and documentation for the meet up, I would love to be able to dive into your valuable resource – 13 people is so many! Plugins like Beaver Builder help, but feel too overwhelming and carry too many options. These prototypes benefit from being simple, no matter your skillset. I totally agree here. I’ve seen so many users falter when faced with a large scale of options in testing. I also adore the simplicity of the current offering. I really think maintaining that whilst adding complexity and extra content blocks is going to be a challenge but one worth conquering. At first glance. I really can’t tell where to write. There is no blinking cursor. And UI look totally like a finished article. Arrows to move paragraph up and down feel clunky and it was not obvious what these did. Dragging blocks is complex and I feel like I’d like to obviously see other blocks (e.g. perhaps outlines) when dragging so it’s clear where I am dragging to. Easy to start writing and add a new paragraph of text. I would argue Headings do not need alignment. And I would argue we don’t need underline as an option (very confusing with links / accessibility). But that is my preference! I can edit the existing image (well its position). That seems nice but I immediately think dragging the next block down up to the left/right of an image may be problematic. What if the next block isn’t text? Should Image + text be one block? Or a combination of two? Perhaps users should be able to drag text areas between blocks to solve this? I think it’s too much mouseclicking to get things done. (also a major point when using pagebuilders). Maybe if I’m in a new text-block and I would start typing a list it would automatically convert to a ‘list-block’ it would be ok.
Maybe when I pasting a large document in the editor it would auto-recognize headers, quotes and lists it would be ok.
Nice clean look-and-feel but VERY unsure if you can keep it that way and maintain good functionality. once you make the first click you get the idea, but is so simple that you get lost on the firs view, maybe i miss a first state that indicate you can edit. I like it so far. Reminds me of Medium. But yes, @remediosgraphic has a point about there not being many visual cues that this is an editor. That might be okay–it’s not as though Microsoft Word gives you a lot of those cues, because you expect a total WYSIWYG experience there. In time people would come to expect this type of experience, or would get to this view by clicking something. I was able to change the title(?) from heading to quote to paragraph. I notice that I have to go back to paragraph between heading and quote, at least after the first change. Not being able to select a heading level is weird. Oh, and if I type enter for a new paragraph after a heading, I get this weird small text that’s not in a box like the regular paragraphs. Not quite sure how to show a screenshot here. That’s a test of my ability to explain a UI, not of the UI itself. Can you write a paragraph of text? Yes. My first thought was to use the + button. My next was to edit existing text. Then I saw someone’s note here about using the Enter key, which I’d’ve figured out if I’d had more coffee. How does it feel? What are your thoughts? It’s a very nice experience, even though it’s incomplete. I expect my clients would love it. *Can you add an image? Didn’t try, though I played with the image resize/position button, which also works the way I remember from Medium. Actually, looking at the editor, I don’t see any means to insert media apart from the not-yet-functional blocks section. If I try dragging an image from Windows Explorer, the image opens in my browser and the editor goes away. Then when I hit the back button, my edits are gone, which brings up the issue of saving edited content. Would this happen automatically, the way it does in Google Docs? What is that “search” box at the top of the editor blocks modal for? Finding content to insert as a link? Finding some kind of editor block that isn’t displayed? Since there isn’t a link block, does that mean people are expected to know to paste a link over the anchor text? Ah, there: it shows up when you highlight text. That’s a little confusing. In that case I’d expect the search-for-content to show up when you click the link button. In the context of the image the icon for the full width image is a bit misleading. On the left you have the option for the centered image, then left aligned with text on the right, then right aligned with text on the left, but the icon for the full width image i associate with either full screen or a drag and drop handle to move the image around on the screen. it also breaks with the style of the other three. I’m sure it’s just a fluke, but the inline style editing pops up when I highlight a word in another popup. Probably just since the style options are loaded on highlight of text regardless of where. May I suggest a Google form or similar to collect feedback for testers who don’t have WordPress.org accounts and/or are not of the Github persuasion? This could also be enhanced by adding specific questions or focus areas where input is needed. I can see that working in the future, although I think it’s good to have it open at this early stage for discussion. A form by it’s nature will exclude direct conversation and also prevent people from seeing what others feedback. People are reporting back currently for big groups. I think we can also maybe in the future have a format so that people in larger groups can use a form and then send us the information. In short, yes we can if it fits the prototype feedback we want at that time. I’m keen we adapt to suit each test. +1 for out in the open. 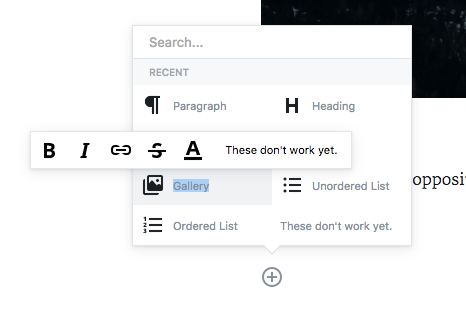 I this and the above prototype are good examples of front-end editing. What does it look like for a completely new post. I deleted all the content out. It’s really unnerving. Also, I expect the + button to be where the cursor is, so I can insert content in the middle of other content. The prototype is looking great, I did some testing (macOS with Chrome) and here’s what I think about it. Selecting text (with the keyboard) doesn’t bring up the toolbar on macOS with Chrome — it appears when I click or click-drag-select. Selecting the text on Andriod with Chrome gives you the option of copy/paste and the toolbar kinda gets stays hidden behind it. When I Select-All and delete everything, the text becomes weirder. When I want to align the text, toolbar appears and the align icons are hidden behind it. I was not able to align the text. I think the align controls should be kept in the same toolbar instead of having the user go through three different ones? Image handling is pretty intuitive! I’ve also added gifs/images to an issue that I created on the GitHub repo. I would also like to mention that we need feedback from writers who do not normally have a GitHub account, a Google form as suggested by Morten, would be a better tool. I love the modern UI. But there is an issue – this doesn’t pass the “mother test”. She knows “Word” and that’s about it. I show anything without “H1-16” and regular paragraph alignment controls that are immediately visible – and the users who aren’t naturally curious will panic and not even try. At least in my experience that’s true. Please, please make sure that any new prototype passes “the mother test”. Modern page builders can do modern things because they’re for a narrower audience than the generic WordPress users. This is why TinyMCE works – I can tell my mother – “Look! It’s just like word. You type and you format the text you like with bold”. She remembers afterwards that she can, because all the controls are in her face all the time. It’s a safety net. When “Make this bold” appears only when you select the text – it makes us techies warm and fuzzy inside, but my mom is going to call me a lot more often. That little “+” to add content is just not enough. I think content should be added without an issue, and the rest should be the task of formatting. users who aren’t naturally curious will panic and not even try. At least in my experience that’s true. I’m mindful of this myself. At this stage, I think the idea can run but as we progress with testing we should widen outside our own pool and minds in who we test on. A little observation, I sometimes find it’s easy to assume what others will or won’t be able to do, my mother in law for example blew my assumptions out of the water by finding the iPad natural to use. This brings me to the point that we need to test with those people to truly understand. This is a small problem, but I found that fitting the image to the whole view makes the up and down arrows disappear. It’s something that I haven’t seen mentioned in the comments so far. As someone new to all of this, I really love how easy this makes it to put content together. From my experience in having to dish out blogs and information at a fast rate, something like this is very useful. I’m keen to see where this goes! – A generic gear icon / function that is there as a placeholder for now. Ideas are welcome. In the flow i am exploring, the user can edit the content of the block by clicking on it of course. This is where a secondary set of contextual actions can appear (alignment, h1-h6, quote, lists etc). I will make my best to have something more cohesive by the next Slack meeting. I hate it. I hate everything about it. I hate it worse than the current visual editor. Which I hate. I can offer no constructive criticism. I will not use this if it’s ever included in core. So what do you not like about it, the UI or something else? How will this be made accessible using keyboard as the only input? This early prototyping stage is the perfect time to consider accessibility. Much of the behavior currently displayed in the prototypes relies on mouse/touch for input while relegating actual content creation to keyboard input. I would love to see some exploration of how keyboard-only (and by extension voice input etc) control could be used to interact with these new features in a seamless manner. How do I jump from the content writing context to the “I want to change the type of block I’m currently working on” context using keyboard commands? How do I jump to a new line and trigger the content type selector rather than create a new paragraph? How do I control the ordering mechanism using keyboard commands, and how is focus handled when content is restructured? I did user testing on the Gutenberg prototype with 5 participants using usertesting.com. The doc contains detailed observations from each of the participants along with videos. > 2 out of 5 users had the first impression that the post was read-only. One of the users understood the + icon to be “Show more” content of post. Bolding text by highlighting and hitting B on toolbar was easy. One user liked that toolbar stayed on screen as she edited the text. Exceeded users’ expectations due to keyboard shortcuts ( cmd + B). Changing a header to quote was absolutely clear to one user. 3 of them tried the up and down arrows and eventually got it with little learning curve and eventually liked the interaction. Some users used the mouse right click. All users preferred if the + icon could float with the cursor so that they could insert content as desired. Or, a + icon appearing between every 2 blocks on hover. One user also tried to hit enter at the start of a paragraph to make space above it. All users expected to have a delete icon to delete paragraph and image and/or have the keyboard shortcuts for delete. Users understood the up and down arrow ( sometimes with little learning ) but preferred drag and drop in situations when posts will be too long and the task of clicking on arrows can be tedious. Not sure how much testing can be done, as this seems to be mostly non-functional. Basic typing and text formatting does seem to work. The up/down arrows work to move blocks by a single step, though I found it frustrating to be unable to drag ‘n’ drop. I keep expecting the little plus next to an empty paragraph to be a button that will let me choose what to add, but it doesn’t seem to do anything. Not sure how we’re supposed to add pictures, or anything other than text. I take it that UI simply hasn’t been implemented yet? Well, what’s there so far seems like a good start. Sorry, didn’t realize the three “tabs” were completely different prototypes—thought they were just showing different example content. I was trying to use the 3rd one, which does not seem to be functional yet. 1 and 2 work ok.
I’ve been out of the loop a long time / don’t have sense of what is normal practice. Is it clear what each section does? None of the buttons work. So, nothing to test. How do the flows for adding paragraphs and images feel overall? I am at WordCamp, Atlanta, Contributor Day.